Lots of running around today! I had to find a new supplier for a product that I normally have shipped from Texas. After Rita is done who knows if I’ll ever be able to get supplies from them again. Luckily I did find someone else to order from. D and I spent the day today getting ready for the party tomorrow. I think we have everything under control and should be a nice day. His eye is looking much better today and I’m sure in few days he will be completely back to normal! He hates it looking that way but there isn’t much he can really do about it but wait. I’d like to apologize to the few people who actually post really comment on my blog for the addition of the word verification. There aren’t many of you and I know it is annoying but the spam is getting out of control! I’ll take it off soon. Wow! This is amazing! I think it is wonderful that people are using popularity to help the Red Cross. I think Leno has the right idea! This is the 2nd (that I know of) bike he has auctioned on Ebay and considering the fact that the MSRP on this bike is only like 17,495.00 they aren’t doing bad with this one. Here is the link to a list of the people who have autographed this bike. Looks like Jay had better get a few more of these lined up for these people who are being terrorized by the hurricanes. I grew up and lived for a very long time on the East Coast so I can honestly say that I know how many of these people might feel. I was fortune and never lost my home and everything I owned or the life of a loved one to any of these storms but I have been caught in several and also have had to leave home because of them. There is really no feeling like walking away from your home and not knowing if it will be there when you return. The amount of time people are given to leave seems like a lot but trust me it isn’t when you have to just drop everything and get out. Two black eyes in a week. First Amos and now D. Well sort of! Today D came home and said that while they were playing basketball at the gym this sport became semi full contact and he was accidentally elbowed in the eye! Yikes I say again that has got to hurt! So we spent the afternoon hanging out and then took a nap because after being beat up he wasn’t feeling all that great. Apparently while being elbowed his glasses were receive a beating of their own and are pretty bent out of shape and his wedding ring took a ride across the court and was rescued by someone standing by. When we woke up from our nap it was very close to time for him to leave for class and so he started getting ready. 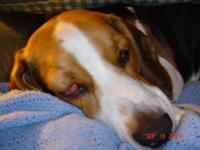 I thought he got away pretty lucky because his eye wasn’t swollen and there didn’t appear to be any bruising. That was until right before he was about to walk out the door he went to blow his nose and suddenly his eye looked like what you see here!! We freaked out! Right away we got into the car and headed for medical. We were there for some time waiting and when they finally saw him they explained that it was air and gave him an antibiotic to take for the next few days! Black eyes seem to be going around! I must be in the steam of a good karma flow because lately I have been blessed with some very wonderful gifts! Yesterday afternoon I receive a package for my dear friend Cindy. She put some time and labor into make some wonderful gifts for me. 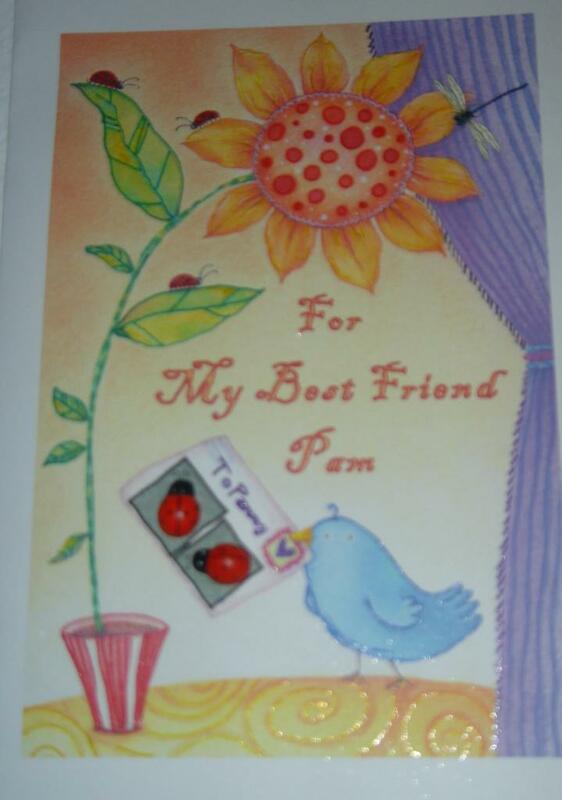 I especially like the lady bug card she made and even more the lady bug family that now lives on the lamp in my office! She also sent me some lovely frames pictures of the two if us in a rose garden. These were taken during her recent visit. I love it all Cin thank you! I haven’t posted anything for the last few days because we have been having wonderful time running around and hanging out with family. Today the house feels so quiet and still with them gone. Even the dog boys are kind of wandering around wondering where their new playmates have gone. We had such a wonderful and fun time with them here. We spent one day in Seattle and took the underground tour. It was really interesting to see and learn about the history of Seattle. I had no idea the city had once burned and was then completely rebuilt. I’m almost certain I came very close to death walking all around the city but it was more than worth it because we had such a good time and I even got a crash course in using chopsticks correctly! Steve and Lorene also gave us the most amazing gift! 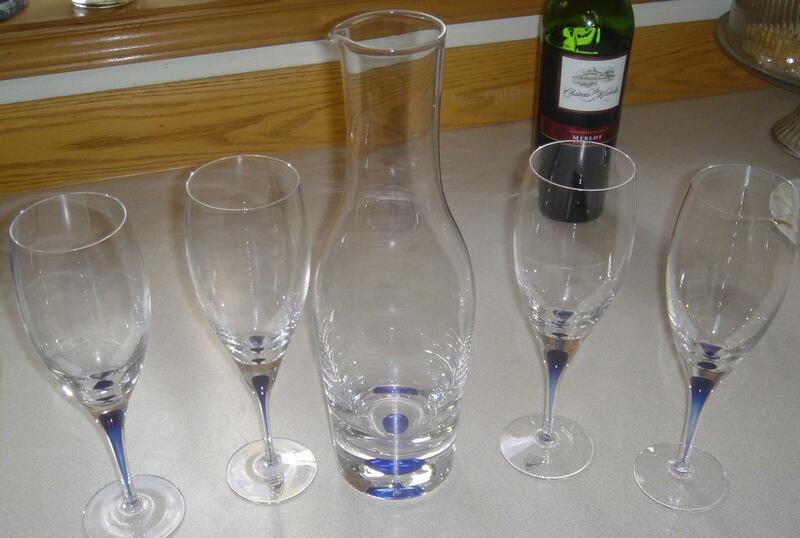 These wine glasses are so amazing! They are hand made in Sweden and they are so beautiful. I have posted a picture of them but they are much more beautiful than the photo shows. They take on an even more interesting look filled with wine. Yesterday I received such an awesome surprise from friend Sally! 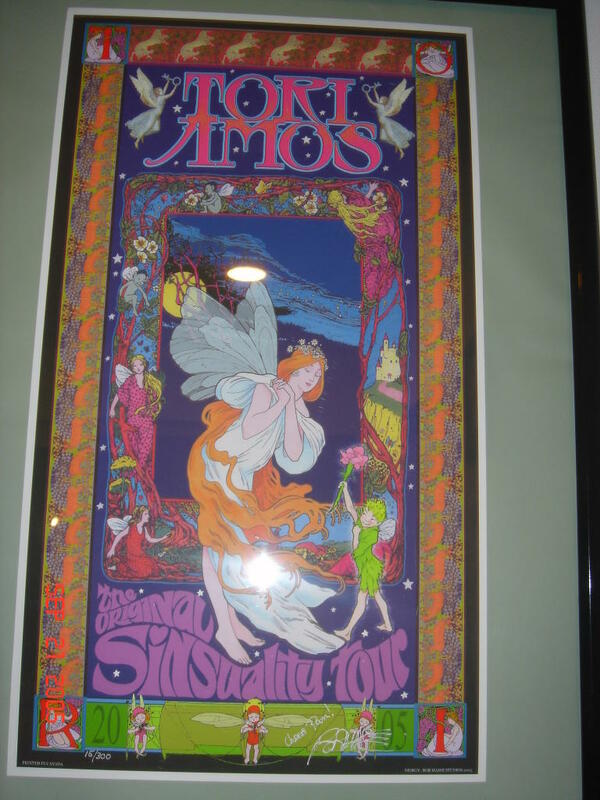 She showed up at my door with the artist signed Tori Amos poster for the 2005 tour! Is this not awesome? She just happens to have the hook up for this type of thing and also happen to be thinking of her little fairy friend (that would be me)! She is very aware of my love for Tori as she heard all about the show and details. She also graciously and with no whining sat through looking at the photos again with me after she had already viewed them here on the blog. I know I know…what a sweet lady! I am desperately trying to think of a way to properly thank her. Needless to say for me this is a really big deal so I’m still working on that one. I have said this before but I will say it again got check out her products! She is amazing! For the most part my home is normally calm and relaxing. It is in a word my sanctuary. In fact it is very warm, peaceful and inviting. Inviting that is to those of us who live here. The boys are normally very good. They share food, drink, the backyard and the bed. Occasionally when they are feeling extreme generous they allow D and I to not only share the bed with them but actually sleep in a some what human position. However, when you consider that we share the home with our very own mini-pack of canines you can bet disputed will arise from time to time. Yesterday evening was one of these times. One of these famous disputes arose late yesterday evening. Amazingly enough it was over a plastic green rubber ball the size of a golf ball that we humans paid a mere 1.00 for the day we picked Cin up from the airport. You must understand however that the canine value of this ball if oh I would say about enough to fund one human a trip around the world….three time. The result of this dispute is clearly noted below in the picture you see. Once the war broke out D grabbed Bentley and made a dash for one bedroom while I tried to calm Amos. Currently Amos is what we call the Bully around here. He is largest and sometimes the meanest but by far he is not the bravest! 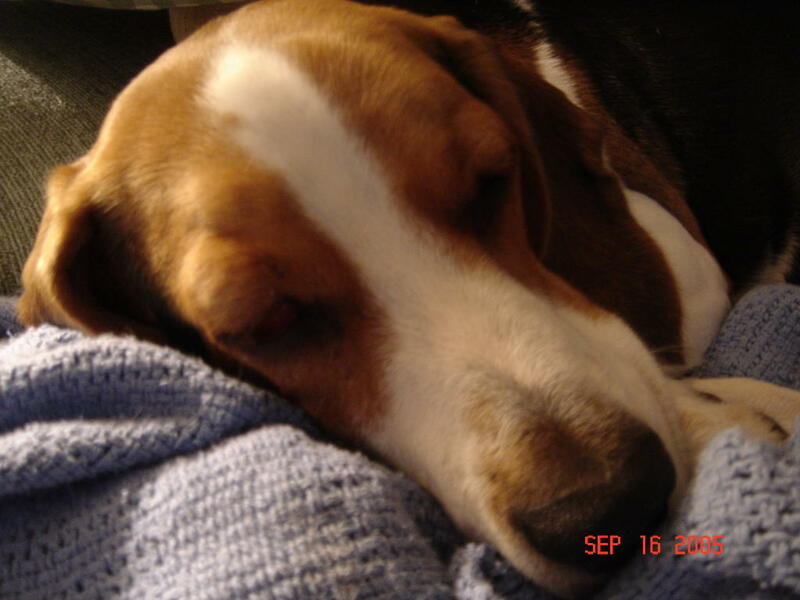 We have come to learn that bravery in the canine world normally comes in a small package. Such as the 20 pound Jack Russell who truly with every bit of the fur on his little body believes he is at least 100 pounds. The same JR who beat up the Beagle over the little green ball! D and I have been talking about it for some time now and we decided today was the day. I have had the EBay store for several years now and it has been a great & wonderful journey. However with my website doing increasing well and the desire to put more money into advertising we have shut down and said our goodbyes to EBay. Over the past few months most of my regular eBay shoppers have migrated over to the website and while the activity on the site has boomed the eBay activity had declined. I know there will be some people who are upset about the whole thing. There are those die hard eBay shoppers who refuse to even look elsewhere. Those people simple don’t understand the fees involved with selling on EBay. D has been working not stop to promote my site and he his put much hard work into it. So it seems the eBay thing has just kind of faded out of the picture for us. So it is time to move on and focus only on the website! The site has traveled such a long way since we started and we both now feel is it is a stand alone project. I don’t normally recommend movies simply because I tend to enjoy the off beat type films more so than the same day to day type films. However, SEE CRASH! I’m not sure what it was about this film but I found it to be rather intriguing. There is a large cast and many things going on at one time. Some are connected and some aren’t. The movie is very different than I expected and though it isn’t the best film I have seen it is definitely worth having a look! I have been watching the Roberts Hearings very closely and I do believe the votes will confirm him. This is just my prediction of course who really know what they are thinking at this point. I will say some of the comments bought up that he has made in the past about women I found very disturbing. However, I keep reminding myself that at that time (the 80’s) the world was in a different place and he was staff. So I do believe that things can change in twenty years. For now I’m not going to focus on that. I also feel like he is “dancing around lots of questions” without giving direct answers. It was pointed out to me by someone that this is his attempt to appeal to the Modern America and remain moderate. Wow...history in the making! I hope everyone is watching this. I am glued to it. I can't wait until they get to the questions! Talk about being in the hot seat. Life for us is for the most part back to normal! With Cin's visit passed and the Tori show over life has settled back into the normal hum of our day to day life. We are now looking forward to a visit from family in a few days! 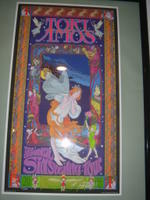 there on the other side"
for this "from the other side"
I have been a Tori Amos fan for many years. Actually it goes beyond being a fan. I'm on the verge of being obsessed! I use follow her all over Florida to attend shows each time she came to play live! So D wasn’t all that shocked when I told him that I wanted to leave hours earlier than we needed to in order to be there in time for the M&G. She is famous for this and she always comes out early in the day before each show and meets with the fans. She signs things, accepts gifts, and takes pictures with anyone who might want that. So D got home early enough and we set on the 2.5 hour drive. We arrived between 3:00 and 3:30 and of course as with all other Tori shows that I have attended there was quite a few people already gathered and waiting. They were numbering hands (this is something the fans do in order to maintain some sort of order) and we were number 49 and 50! We asked one person who was on staff about the M&G and were told that due to security issues that wasn’t on the calendar this year! I had huge doubts about this because as I said she always comes out. So we just hung out to wait and see. Our plan was that I would attempt to meet Tori while D (because he is tall) would snap pictures the whole time and try to get some good shots! When the time came everyone there was a little insane I think. The man in charge “Smitty” came out and told us all what was going to go down. He set-up a table and explained that as long everything remain orderly we would shortly be able to meet her. At first were kind of on the side and I was a little worried about being about to get up to where she was to actually speak with her and have her sign my book. I had given the gift to Smitty earlier to be sure that she received them. I didn’t want to risk the chance her not getting them. She started at the end farthest from us and worked her way to our end. This worked out perfectly because D was able to get so many amazing shots of her. There was a person next to me who was clearly in the perfect spot to be next to chat with her. I asked if he had something for her to sign and he said no. I thought I might be able to give him my book and let him have her sign it even if I didn’t get to speak with her. When I asked he said “No I’d rather not do that. You’ll be able too”!! At first I thought he just didn’t want to do it for me. But I realized later that wasn’t the case at all! Once he had spoken with Tori and they were done he literally grabbed me and moved me directly in front of her in his exact spot! At that point I was standing directly in front of her face to face. So to that stranger I would like to say thank you! I realize now that it wasn’t that he didn’t want to help me out but he wanted to make sure I had my own experience and memory of her! Thank you so much! So there I was standing in front of her. She smiled the most amazing smile and said Hello…I asked her if she would sign the book for me and she said of course. We chatted for a few moments while she signed the book and then D took a few pictures of us together. The time was getting short and she needed to get going so she could do her sound check so after the pictures were taken I made sure to move out of the way so someone else could move forward and speak with her. While all of this was going on with me my wonderful husband was doing just as I had asked. He was taking pictures and making movies! I have included the link for these below. Take a look and enjoy! I would also like to say that we met some very nice people at the show and we had a wonderful time. The show was amazing! Tori fans are some of the most wonderful people in the world. The Tori Show is finally here! I thought since I am really so excited and really don’t have lots of time today anyway I would post a picture of the Ladybug as promised!! Is she not adorable? The picture was taken in light so it doesn’t really show how beautiful she is at night when she is lit up but still you should get the idea! Maybe she will bring me good luck! It has taken me almost a week to get caught back up with everything. Wow not working for a week can really put you behind! So now all is well and tomorrow is the Tori Show in Woodinville. D wasn’t about to get the whole day off but he will be home in time for us to leave early and make the 2.5 hour drive. Our goal is to get there in time for the meet & greet and hopefully I’ll be able to give Tori the gifts I have made for her and also have my book signed. We are both very excited! I haven't posted anything in while and I do have lots to post about but for now this is so amazing. Below is a link to the diary of one person who actually lived through Hurricane Katrina and documented everything very well. There are over 190 pictures here of the before and after of New Orleans. It was so odd for D and I to look at these because we have been to all the places shown in this. At the end there is an amazing aerial view of before and after. This person did a wonderful job in the middle of everything that was going on! I can only say that I feel great sadness for the people who are suffering. If you can do anything to help please do! This morning was interesting having to wake up at 2:30 am to get my Cin to the airport on time. We did attempt to change her ticket but with it being a holiday weekend that was impossible. So amazingly enough we made it on time for her catch the 6 am flight back Florida! I was really sad to see her go. We did so much while she was here and had such a wonderful time. We love the Zoo and Cin bought me the most amazing lady bug lamp! I know it sounds questionable but trust me is it adorable! Later I’ll post a picture and prove that! She really did enjoy Washington and the Casino!! I loved having her here and was very sad to see her leave. I just hated to say goodbye. I think we both did. I did get a little lost coming home from the airport! I tried to use the GPS and it wanted to drive me to the ferry because it saw that as the shorest way home. I gave up on it after I had it drive me back to the airport! I was only about 10 miles out of the way but it was 5 am. Scary for me to say the least! I found my way pretty easy once I decided to do it on my own. Now I am so behind with everything now so I doubt I’ll be updating for a few a days until things are back to normal.